June 22, 2015 May 21, 2018 by Beau H.
Getting full details on a newer denim brand — featuring the Skinny Fit Mosco jean in Dark Blue from Mott & Bow. Organic cotton pocket T-shirt by United By Blue. Glasses by Warby Parker. Stainless steel dive watch by Invicta. Olive leather slip-ons by GREATS Brand. If you’re looking to upgrade your style, or even just refresh it a bit, there’s virtually no better place to start than buying a classic pair of dark denim.. especially from Mott & Bow. Take it from a guy who’s tried the brand, folks. The styling potential for a nice, inky dark pair in a slimmer fit is virtually limitless — in a business casual environment, they work just like slim khaki chinos worn with a blazer and chambray shirt. And the rest of the time, they’re a great go-to piece matched with a pocket T-shirt and slip-on sneakers in the summer (as seen above), or with a shawl cardigan in the fall & winter. Finding the right pair, built to last and at a decent price, has definitely gotten easier over the years, what with the popularity of American-made brands like Gustin,but if you’re able (or looking) to spring for something a bit further up the price ladder than that, Mott & Bow would be a nice place to start. A slim, tapered fit allows this pair of jeans to sit nicely over slip-on sneakers for the summer months. Denim by Mott & Bow. Sneakers by GREATS Brand. Founded by University of Michigan engineering grad Alejandro Chanin, who grew up around a family of denim producers, the brand has expanded aggressively thanks to a Kickstarter campaign that shot very quickly past its goal last year. Mott & Bow has set out to perfect what it calls “denim science” using fabric sourced from Turkish mills, and the brand does a nice job of walking you through the steps in its process on its website. As an added perk, Mott & Bow offers a home try-on program with free shipping both ways — an ideal way to test out a pair. I had the chance to catch up with Alejandro earlier this spring for a chat about M&B, and he was nice enough to provide me with a sample of the brand’s Skinny Fit Mosco Denim in Dark Blue for review (also covered in a shorter piece on GearHungry). Wear these jeans with everything from a pocket tee to a blazer. Braided leather belt by Target Merona. Stainless steel dive watch by Invicta. The brand itself differentiates between its models through a neat touch — the street names of its NYC home. The Mosco is one of 6 models in its Comfort Denim line, which features jeans with 2% elastane stretch built in. Slim and Straight fit options are available, both of which still look nice and tailored, but the Skinny option (with a narrow 13 1/2″ leg opening) was the pick for me. Overall, Mott & Bow jeans fit and feel quite similar to a pair of Stretch Slim Fit Jeans from Uniqlo; if you’re into a pair of heavy selvedge denim, the Mosco and some other options likely won’t be for you given their lighter weight and hint of stretch. However, the Rivington, a raw, never-been-washed offering, comes in Slim and Straight fits for the company’s standard price of $96. And it’s also worth checking out the Norfolk Raw Slim if you want a sturdier jean in a slim fit. A sturdy leather patch and simple back pocket stitching complete this pair. The color of the Mosco in Dark Blue is rich and deep, although pre-faded options are available replicating everything from 2 months to 18 months of daily wear (the Waverly in Light/Medium Blue would be ideal for spring & summer). Colors like Dark Gray and Black can also be picked up for $12 more. The fit on this Skinny pair is excellent — akin to that of a pair of Bonobos Slim Tailored Jeans or even something from J. Crew’s 484 line. Mott & Bow definitely gets a lot of things right. The tapered leg sits nicely over chukka boots, while it can also be rolled a few times (as seen in the photos above). The hint of stretch keeps these comfortable, too. The rivets and back logo patch have sturdy placement, small details that upgrade it from similarly stretchy, but cheaper, pairs. No wild stitching or branding from Mott and Bow — just a clean logo across the interior back waistband. Wearability with a new pair of denim is key. These Mott & Bow jeans feel so comfortable thanks to the resin rinse process — designed to replicate raw denim — that there’s no break-in time needed. In a size 34×32, I’ve found I can also cuff them if needed. The simple detailing and nice color make these the ideal pair of dark denim — I’ve worn them with a khaki blazer and a casual shirt, as well as a long-sleeve henley. The delivery presentation of the denim itself is also well-done — custom black tissue paper and a large ‘M’ emblazoned on a black box change things up from the standard brown box presentation some brands go for, as you can see below. 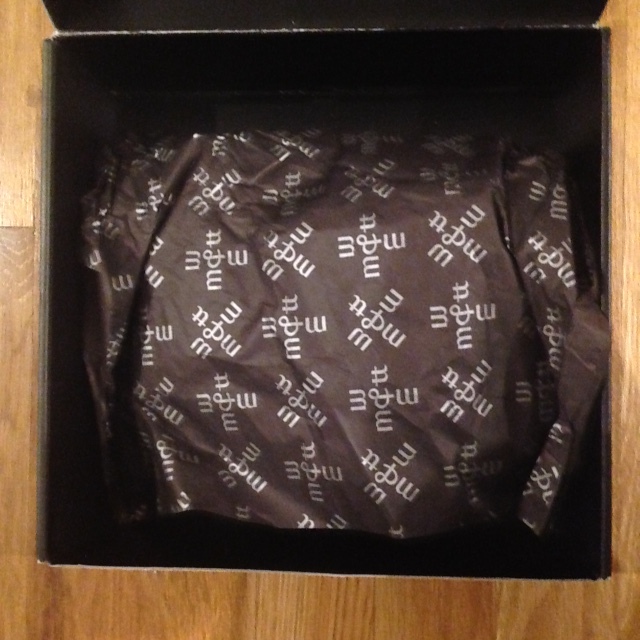 The packaging and presentation accompanying a pair of Mott & Bow denim. The one drawback might be that price –at just under $100 for a regular pair, it’s a good deal more than other options. Of course, cheaper pairs are out there, but the fact that Mott & Bow focuses exclusively on great-fitting denim means the brand is putting everything it has towards that product; the results reflect that. For now, sticking to a tried-and-true pair of Levi’s is a safe option if you’re on a budget, but if you want to switch things up and add to your dark denim rotation, Mott & Bow could be just what you’re looking for. Do you own any Mott & Bow denim? Have you ever considered buying from the brand?